The year I was born -1958 - saw Little Richard’s 'Good Golly Miss Molly' high in the UK pop charts. My theory is that I heard it in the womb as, four years later, and old enough to work my parents’ Garrard record player, Little Richard was always my number one choice for the eight 45s I could stack on the interchanger. My love for the man and his music has never waned. I first saw Richard live at Wembley in the early 70s as a pre-fourteenth birthday present, and by 1974 I'd heard most of Richard’s available recordings, and owned everything that I could find and afford. By 1975 I was also starting to hear other records that sounded like Richard in his full rock'n'roll mode but by with exotic names like Pretty Boy, Big Danny Oliver and Bunker Hill. 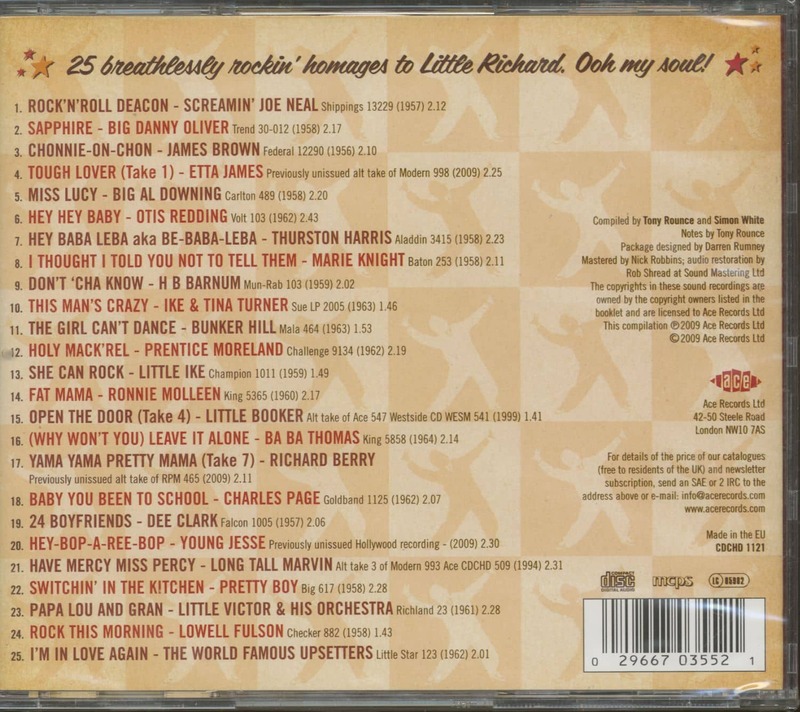 Over the next few years, trips to the many specialist Oldies stores which then still existed in far flung corners of London were rewarded with the occasional ‘Richardalike’ 45s, but low wages and a blossoming desire to hear more Northern Soul (prompted by the Georgia Peach's Okeh label recordings) prevented me from buying albums - including a bootleg containing Little Richard soundalikes which I passed over, buying a Canadian Brunswick copy of Richard's 'Baby, Don't You Tear My Clothes' 45 instead. This compilation is a bi-product of that decision made 30 years ago, and it's been worth the wait. If you were a Martian and had never heard the music Little Richard recorded for Specialty, these 25 tracks of full throttle, classic R&B would be the most exciting thing you’d ever heard. Some have been unheard for years, some have never been heard at all and many from some of the most iconic names in black music. They all pay homage to the Bronze Liberace and to his classic sound. And yes, it is homage. 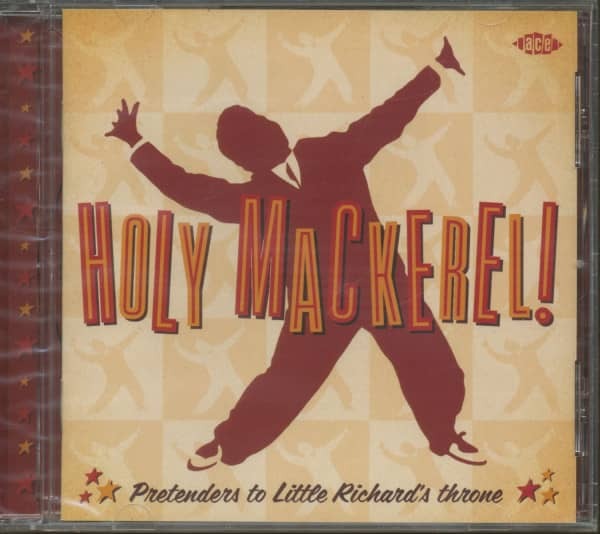 Although some of these recordings were made with one eye on any sales that Richard's surprise 1957 retirement might bring, that doesn’t fully explain why Ba Ba Thomas was recording in Richard’s style and evoking the spirit of ‘Long Tall Sally’ in 1964, or why Bunker Hill was still hell bent on ripping it up in 1963! The influence of Richard on James Brown, Tina Turner, Etta James, Joe Tex, Otis Redding, HB Barnum, is unquantifiable but undeniable, and they’re all here. Add in R&B icons like Don Covay, Big Al Downing, Dee Clark, Marie Knight, Richard Berry, Thurston Harris, and Lowell Fulson and lesser known acolytes Screamin’ Joe Neal, Prentice Moreland, Charles Page, Ronnie Molleen, top them up with a brace of other ‘Littles’ – Ike, Victor and Booker, and garnish with an unreleased gem by an alternate universe version of Young Jesse (see sleevenotes for clarification) and the man himself, on his ‘secret’ 1962 session with the World Famous Upsetters, and you have here what are some of the hottest rock’n’roll recordings since Mr Penniman laid his solid foundation for popular music 50 something years ago. 09 Don't 'Cha Know BARNUM, H.B. 23 Papa Lou And Gran LITTLE VICTOR & Orch. Customer evaluation for "Holy Mackerel - Pretenders To Little Richard's Throne"